Newman was a cornerstone of the American cigar industry, and spent more than 70 years in the business. He bore witness to revolutionary changes in the way cigars were sold and made, and had to transform his company several times to ensure its survival. He entered the business in the days when cigars sold for a nickel, and a one-cent price increase could destroy a brand; traveled often to Cuba to buy millions of dollars worth of tobacco on nothing more than a handshake, and changed his blends when the Cuban leaf he used became illegal due to the U.S. embargo; and finally lived through the cigar boom of the 1990s, watching his cigar brands reach heights undreamed of in decades past. Newman’s company, the owner of Cuesta-Rey and Diamond Crown cigars, makes cigars by machine on the highest floor of its sprawling headquarters in Tampa, Florida, and it distributes the cigars made by Tabacalera A. Fuente y Cia., which rolls the company’s premium brands in Santiago, Dominican Republic. 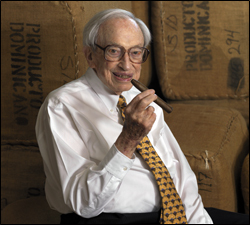 An indomitable spirit, Newman remained active in his family business up until his final days, and was at work when he fell ill.
Newman took great pride in owning a successful, enduring family business — J.C. Newman Cigar was founded more than 110 years ago — and took special pride in working alongside his two sons. With the Fuente family, Stanford Newman founded the Cigar Family Charitable Foundation, which is working to improve the lives of the people of the cigar-producing areas of the Dominican Republic. For more insight into Stanford J. Newman and the important role he played in the American cigar industry, see this extensive interview with Cigar Aficionado from 1997. Make sure to check out the Cigar Family Charitable Foundation link in the article. It looks like the Fuente and Newman families are doing some amazing things for the people of the Dominican Republic. If you can, I would urge you to make small donation.